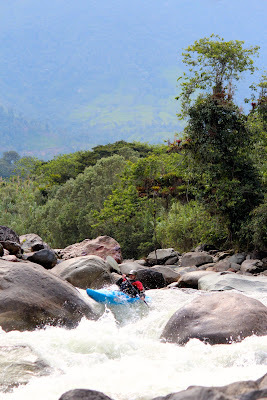 Small World Adventures--Kayak Ecuador: Patch's World Tour comes to Ecuador! December found us boating with Patch, Midge and Derek on one of our "Torrents" trips. We name these trips after the rapid-loving Torrent ducks that frequent the same rivers we do. They have an unfair advantage when in comes to boofing - the wing assist. But we try to keep up with them as best we can. It sure must be nice to be able to fly away if you decide you don't like your line. It's been a good couple of months to be Patch. He's just about halfway through his "World Tour," and getting in his share of great kayaking. He just came from Nepal, and he stopped in at Small World Adventures and Ecuador on his way to Chile. Ecuador should be on everyone's list of "must go" countries. 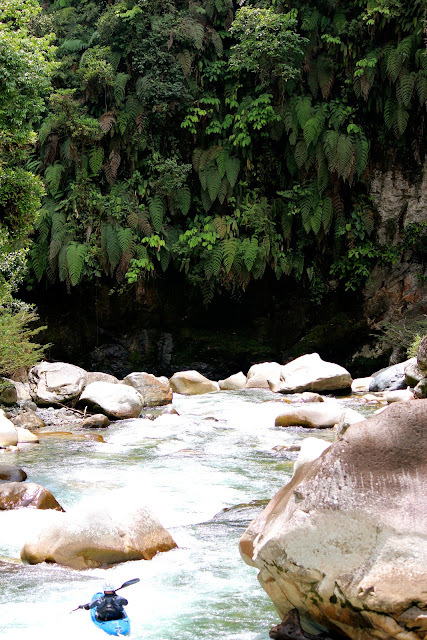 Great paddling, warm weather, friendly people, jungles and monkeys oh my. While the jury is still out, I'm pretty sure Patch is going to rate Ecuador up there near the top of his list of favorite kayaking destinations. I know it's on the very top of my list. Midge also has some enviable vacation time. In exchange for agreeing to check in with the home office via email, he gets to be in Ecuador for a whole month! He's been boating six days a week, and I think maybe even has looked forward to the occasional "office day" to rest up a bit after all the paddling he's been doing. Derek on the other hand was here enjoying a more typical vacation - one week. But that still gave him time to get on five different rivers and seven different sections before heading back home. Even if cold beer does get to the Piatua, I still like coming back to our lodge. The climate around our place is just a bit friendlier. I like to go visit the heat, but it's great to come back to our place and enjoy a cool evening on the porch. Christmas is just around the corner, and here I am talking about enjoying cool evenings and beers on the porch. If you're tired of the cold and snow, and want a taste of warm tropical boating, come on down. Stay for a week, stay for a month, heck maybe stay for 22 years. We'll keep a beer in the fridge and a boof on the river for you.